Experienced servers, part-time. The success of the restaurant depends on our employees. Because we are small, you will need to perform multiple job functions in one shift, including host(ess), cashier, server, dishwasher, busser, prep cook, janitor, bartender. Check out the job requirements and download the application form. Fill it out and fax it, mail it, or drop it off at Barnacle Bistro in a sealed envelope with "Job Application" written on the outside. Good luck! 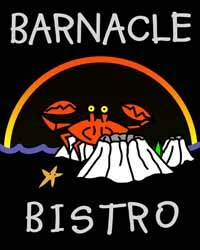 We hope you will become a member of the Barnacle Bistro family.